APTET Hall Tickets 2019 /APTET 2019 hall tickets, APTET hall tickets, TET hall tickets, APTET 2019 hall tickets, APTET exam date, APTET hall tickets would be available at APTET Official website: https://aptet.apcfss.in/. APTET 2019 exam schedule announced, notification released on December 14 at cse.ap.gov.in: Andhra Pradesh’s Human Resource Minister Ganta Srinivasa Rao on Wednesday released a schedule for Teachers Eligibility Test (TET). The complete notification has been released on December ... The online submission of application forms will begin from December 18 and will continue till January .., 2019. The candidates who intend to be teachers for classes I to V have to appear for Paper-I and the candidates who wish to teach classes VI to VIII have to appear for Paper-II / Paper III. The candidates who intend to be teachers for all classes from I to VIII can appear for both papers, Paper-I and Paper-II/Paper III. 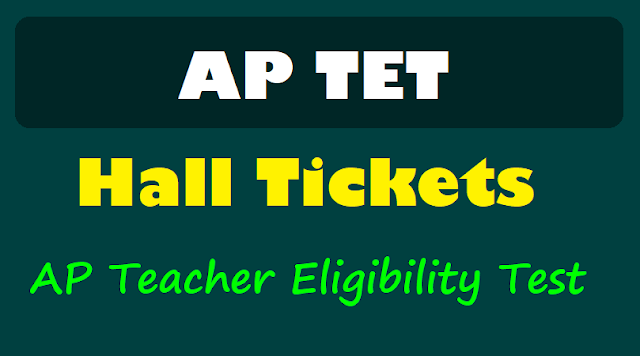 Andhra Pradesh Teacher Eligibility Test, APTET 2019 Hall tickets are to release shortly on the official website aptet.apcfss.in. Candidates who have applied for the examination are required to download the Hall tickets from the official website. Please note, that the Hall tickets would not be sent to the email address of the candidates. Also, in the interim, the Mock Test for APTET 2019 is now available on the official website. Candidates can check the same. The updates on the status of the APTET 2019 Hall tickets would be made available on the page. Commissioner of School Education, CSE Andhra Pradesh has released the official notification for the Andhra Pradesh Teacher Eligibility Test, APTET 2019 revised schedule of examination. The official notification available on the website confirms that the (SGT) Paper I, (School Assistants) Paper II A and Paper II B(Language) for APTET 2019 would now be conducted from June .., 2019. The examination would be conducted in two sessions - a Morning session from 9:30 am to 12:00 noon and Afternoon session from 2:30 pm to 5:00 pm. The Hall ticketss for APTET 2019 would be released on June 5, 2019, on the official website aptet.apcfss.in. AP Teacher Eligibility Test (APTET) postponed following a request by students seeking some more time to attend the exams. The TET exams will be conducted from June ... Government has been giving priority for the benefit of students and hence it has taken this decision, while announcing the re-schedule of the TET. A total of 4,46,833 members applied for TET exams in the state. The exams will be conducted on online. Out of all the applications, there were 1,80,249 members applied for Paper -1 (SGT), 2,12,794 members for Paper 2A (School Assistants) and 53,290 members applied for Paper -2B (Language), the Minister added. APTET Paper-I, Paper IIA and Paper IIB would be conducted. The examination would be held in two sessions 9.30 am to 12 noon and 2.30 pm to 5 pm. The online mock tests would be conducted from May .. onwards. The candidates can download the hall tickets from June 05. The answer keys will be released on June .., and objections on the initial key would be received from June ... The exam conducting body, the Commissionerate of School Education (CSE), will publish the final keys on June ... APTET 2019 hall ticket or admit card download process will begin on the official website of the test. The online application process of Andhra Pradesh Teachers Eligibility Test (APTET or AP TET) 2019 was conducted till... this year. According to the new schedule released by the Andhra Pradesh Commissionerate of School Education (CSE), the APTET 2019 exams will be held from June 10. The AP TET 2019 exam will be held in two sessions; the first session will start from 9.30 am to 12. 00 noon while the second session will be held from 2.30 pm to 5.00 pm. Afternoon session: 02.30 P.M. to 5.00 P.M. The APTET 2019 examination would now be conducted from June 10, 2019. The new schedule is available on the official website. In order to check the new schedule, candidates can go to the official website and check under Important notice. Commissioner of School Education, Government of Andhra Pradesh to be released the admit cards /Hall tickets of candidates for Andhra Pradesh Teacher Eligibility Test (APTET 2019). According to the revised schedule, the admit card/Hall tickets download facility was to be available from June 3, 2019 onwards at cse.ap.gov.in. The examination will be held from June ... The examination will be held in all 13 districts of the state through computer based test. According to the APTET revised the schedule, January 23 was the date for releasing the online mock test facility for the applicants. As of now, the CSE has not released the link for the online mock test facility. Know Your Previous TS TET /AP TET Hall Ticket Number/Results - How to Know?